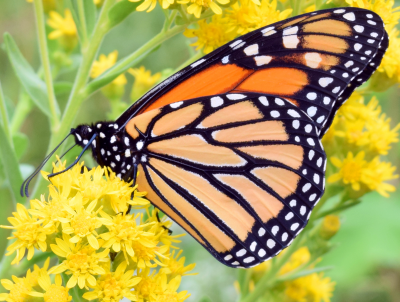 Ames, Iowa—Iowa Learning Farms will host a monarch butterfly and wetland field day Wednesday, June 14th. The 10:30a.m.-12:30 p.m. field day will be held at a CREP wetland near Story City. The field day is free and open to the public and includes a complimentary meal. The field day is in partnership with Iowa Monarch Conservation Consortium, National Fish and Wildlife Foundation, Iowa Department of Agriculture and Land Stewardship and Pathfinders RC&D. As pollinators, monarch butterflies are important to Iowa agriculture, landowners and citizens. Monarch butterflies populations have decreased by nearly 80 percent in the last twenty years. They continue to face many challenges including the loss of milkweed and nectar plant habitat in its spring and summer breeding ranges. Female monarchs only lay their eggs on milkweed plants, and the hatched caterpillars feed exclusively on milkweed. Wetlands provide a great opportunity to establish monarch habitat, as do roadsides, rights-of-way, ditches and home or community gardens. The field day will begin with Conservation Reserve Enhancement Program (CREP) coordinator Judie Krebsbach who will discuss the importance of wetlands for water quality and habitat. Adam Janke, Iowa State University Extension and Outreach Wildlife Specialist will lead a discussion on the role of wetlands on the landscape for wildlife and migratory creatures, including water fowl and monarch butterflies. Seth Appelgate, ISU Monarch Workgroup, will share details about current research projects and opportunities to establish monarch habitat. The field day will be held at a CREP wetland near Story City. From Story City, head south on Hillcrest Drive for 1.5 miles. Turn left to go east on 130th St for 3 miles. Turn right to head south on 590th St. for 3.5 miles. The wetland is on the east side of the road and marked with field day signs. The workshop is free and open to the public, but reservations are suggested to ensure adequate space and food. Contact Liz Juchems at 515-294-5429 or email ilf@iastate.edu.